Verium on a VPS ? Discussion in 'VeriTalk' started by BitcoinPorn, Sep 4, 2016. If I could have someone set up a Verium wallet on a VPS, what is the easiest Linux version to use (latest 64 bit Ubuntu? ), and how does one install the Verium wallet on that VPS? Did you already find a host? Most have 1 click install for various Linux distros (debian/ubuntu etc). That will get you mining. If you want to be able to RPC connect to it, add the appropriate rpcuser=, rpcpassword=, server=1 lines to it. Obviously, now I know you can do headless via the conf file lol. In addition, I know D.O. do not like mining per se, so I installed cpulimit and set max to 80% of cpu usage. Decided to give it up as a failed job, but worthy job as the estimated block hit time was ridiculous and would be uneconomical. Thanks for this CarpeExonumia. I think the VPS I will be given access to is on Digital Ocean so your information and testing is really helpful, I will drop down to 14.04 and try with that unless anyone knows what can or needs to be updated in the other install. Is this wallet something that should be worked on that make it a super clean easy install on all operating systems or is this the cause of the VPS ? Please feel free to try/test it though yourself. Alben, souljah1h and ohNomang like this. It's been 4 days since my last block on my Mac at 1100 H/m so I'm not holding out much hope for the RPi - Enjoyed the exercise of getting it built and even running on the RPi though. Will let it run as it's doing nothing else at the moment. My RPi is now melting lol, well getting a little warm. Cool how much did you pay for that RPi? Looking online you could get one for $40. At ~70 H/min you could buy about 70 RPi for about $2,800 and build a RPi farm for a total hashrate of about 5000 H/min. It seems to get this hashrate by buying computers you may have to spend about 2x as much if you assume at minimum it's $500 per computer which maybe can give you 500H/min, or at least competitive with computers. I'm impressed with what that RPi can do. souljah1h and ohNomang like this. It is still going strong this morning too. I would imagine some kind of additional cooling would be needed for that number of boards though as they will get quite warm. Will save on heating bills in the winter though lol. 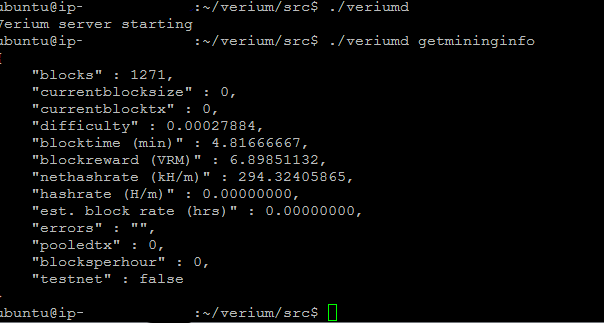 I'm looking for a tutorial on how to run a headless miner for VRM - im about to try and run it on 300 amazon instances. Alben and Janek like this. any idea why thats happening? when you run getinfo does the block count match that of the current block number from the blockchain explorer ? This is what im getting. Do I need to run some kind of command to sync the blockchain like the GUI version does automatically or something? When I try and run it a second time it just hangs with no reply stopped it after 20 minutes. Also, how do I crate the wallet? Is it automatic? Do i need to setup it up with a password? does it mine automatically into the present wallet.dat? Thank you, stats looking better now. I'm running a 35 cpu server, but with genproclimit=35 - I still only see 1 CPU running fully using 'htop' (althu every few seconds a different cpu is running at 100%, seems like it switches around) - How do I make all the cpus run at once? edit: they all run - just had to wait for everything to sync.